Lately I seem to be cycling through a range of crafts, so many ideas and things that I want to do! Sewing, knitting, spinning, embroidery – I want to work on all the things! 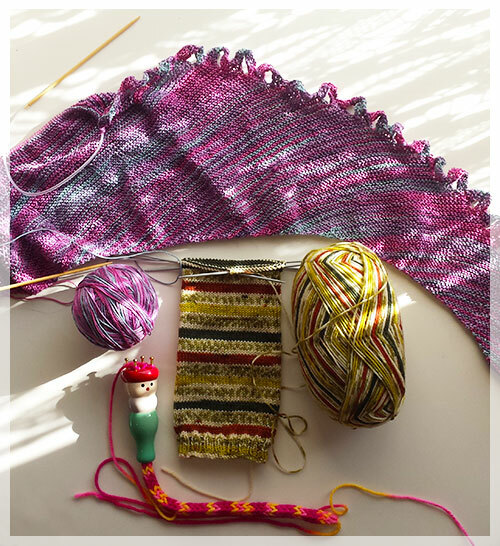 My current knitting projects are a Miss Winkle shawl by Martina Behm and a pair of socks for my darling husband; the sock pattern is from an old issue of Yarn Magazine. I’m using Patons Patonyle (in what seems to be a discontinued colourway) for the socks and Lonco Multy by Araucania for the shawl. There is also a wee bit of french knitting going on, you may also know it as spool knitting! I had a Knitting Nancy model as a child, and, feeling nostalgic, started using my ‘modern’ french knitter with some Red Heart Aran yarn that I found in BigW – I couldn’t resist the big balls and colours! I think I will make a rug with the finished knitting. Random fun fact! The longest work of french knitting measures 26.33 km and is still growing! Question, to anyone who still visits me *echo echo*, should I import my old blog entries or just leave it as a new blog? Is it too boring without archives? Am I too weird? What will I craft next? Stay tuned….